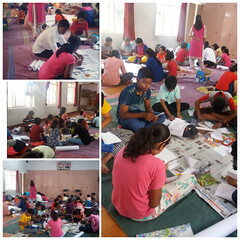 As a part of the camp students were taught Shlokas, Yoga, Patriotic songs, Stories, Games, Maths 3D magic, Gardening etc. There was an interaction based on films on freedom fighters and present social problems faced in the society. Alumni of VKV Kallubalu is taking the responsibility of conducting this camp. Few resource persons like Sri Kuldeep Somaiah, Bengalure, Sri Suhas Sen, Kolkotta, Sri Sivakumar, Jangal Palya were the resource persons to teach various subjects. As the part of the camp students were invited as resource persons to conduct 3D magic workshop in PDCs in VK Vidyaranyapuram and Rashtrottana Parishat.